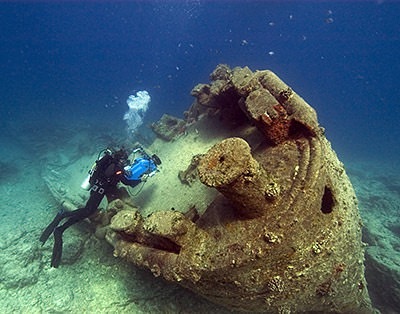 Remains of the USS Macaw that sank near Midway Island. Overshadowed by the controversy over shrinking the size of national monuments that protect large swaths of the United States’ western landscapes, is a parallel effort to change the protected status of the nation’s marine resources. While all eyes have been focused on Department of the Interior, the Department of Commerce has been preparing its own report on the future of marine national monuments and national marine sanctuaries. The report is not yet public, but could impact a broad area of the nation’s off shore real estate. Included in the Department’s review are the Marianas Trench, Northeast Canyons and Seamounts, Pacific Remote Islands, Papahānaumokuākea and Rose Atoll marine national monuments as well as the Channel Islands, Cordell Bank, Greater Farallones, Monterey Bay and Thunder Bay national marine sanctuaries and the National Marine Sanctuary of American Samoa. Taken together areas make up 425 million off shore acres in the Atlantic and the Pacific Oceans. The Department of Commerce could propose changes to these protected areas such as boundary reductions particularly for the more recently designated national monuments like the recent expansion of Papahānaumokuākea, which is also inscribed as a World Heritage site. However, just as risky to the conservation of these monuments and sanctuaries as a boundary change would be change in permitted activities. For example, allowing energy development such as off shore oil and gas drilling and allowing commercial fishing in areas where it is now banned. 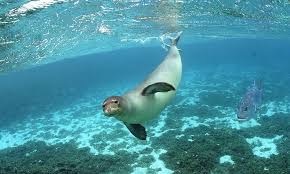 At this time national marine and monuments sanctuaries are similar to national parks. Although fishing is allowed in some of them, oil and gas drilling is banned, as is undersea mining. The review began in April of 2017 with an Executive Order that directed the Department of Commerce to examine six national marine sanctuary expansions and five marine national monument designations and expansions are part of this review. In the Public comment period over this summer nearly 100,000 comments were received, with 99 percent in favor of retaining the existing boundaries of the protected ocean areas. But the cold facts are that public opinion may carry little weight. The Commerce Department’s recommendations have not seen the light of day, however, if the outcomes follow the path of the land based monument things are not looking up for the marine protected areas. President Trump has already announced he will shrink the boundaries of two national monuments in Utah Bears Ears and Grand Staircase-Escalante and this could just be the beginning. Recently the Department of the Interior offered its largest lease sale ever for oil drilling in the Gulf of Mexico. This action sounds an ominous note for those marine landscapes whose special protective status maybe stripped away. Stay tuned. One side note: Why is the Department of Commerce undertaking this review? The answer is that through a quirk in evolutionary bureaucracy the National Oceanic and Atmospheric Administration , which has its roots, two hundred years deep in the U.S. Coast and Geodetic Survey and the US Fish and Fisheries Commission, has the current responsibility to oversee both national marine sanctuaries and marine national monuments a system that conserves a network of ocean and Great Lakes environments with extraordinary biodiversity, scenic beauty, cultural heritage and economic opportunity. .